Ive been dreaming up this project for the last 3 years after the day a club member asked me what I would do different when building a V8 Corvair. I told him I would use a GM supercharged 3800 (L67) instead of that thirsty V8. I spent a good year or so trying to convince him to build such an animal, but then realized I would have to do it myself. So here we are. 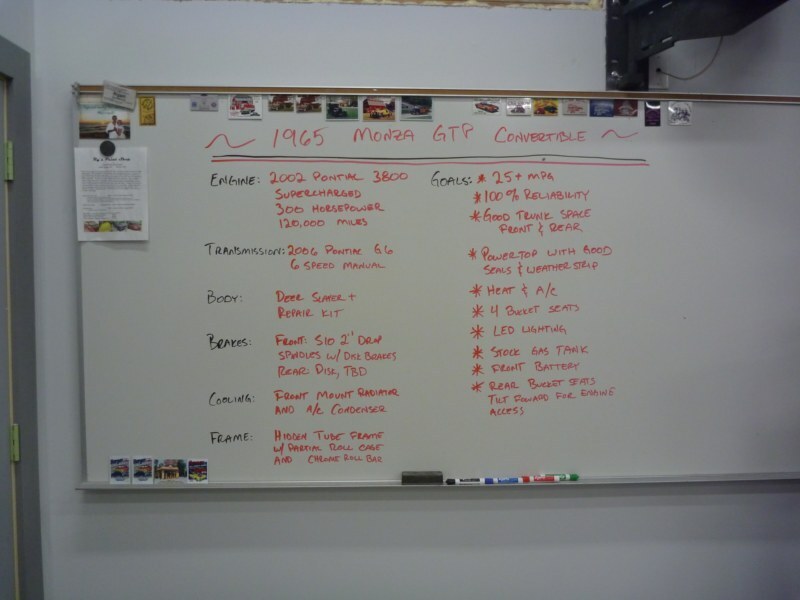 Ive been collecting pieces and parts and its time to do a little more white board planning and get this thing on track! Car: 1965 Monza Convertible, I have already restored it, smashed it, and stored it. After searching the area for a lesser damaged car, for now, the Deer Slayer will get the GTP treatment. 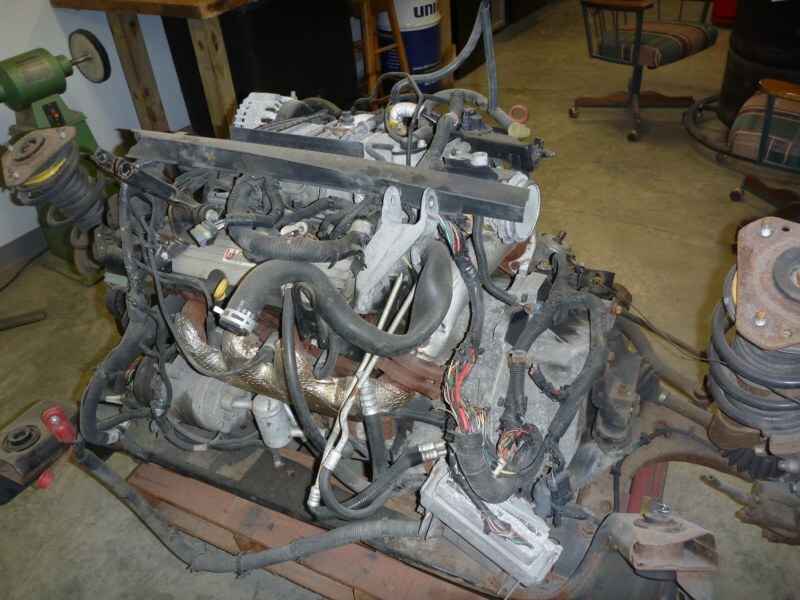 Engine: 2002 Pontiac Grand Prix L67 3800 Supercharged V6, 240 HP from the factory, will be over 300 when installed. 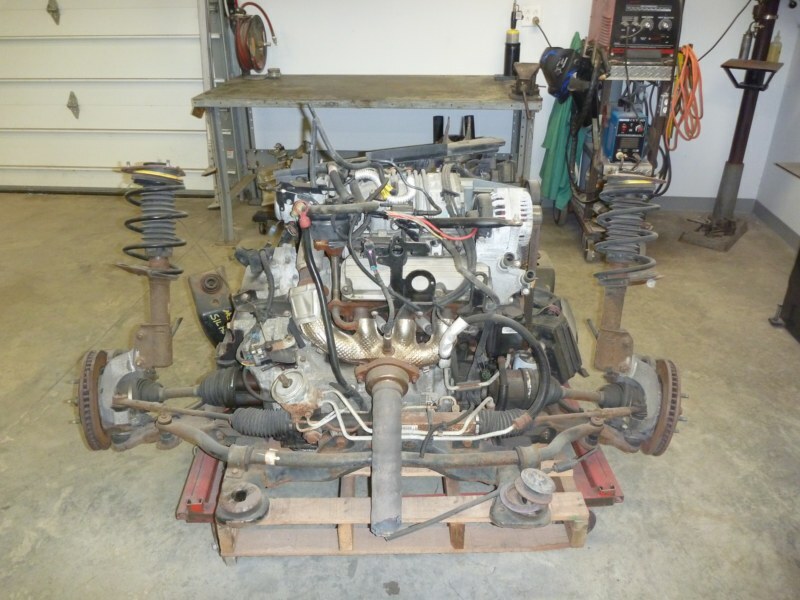 Engine was pulled out of a babied car that had 120,000 miles on it. Lots of life left in her! 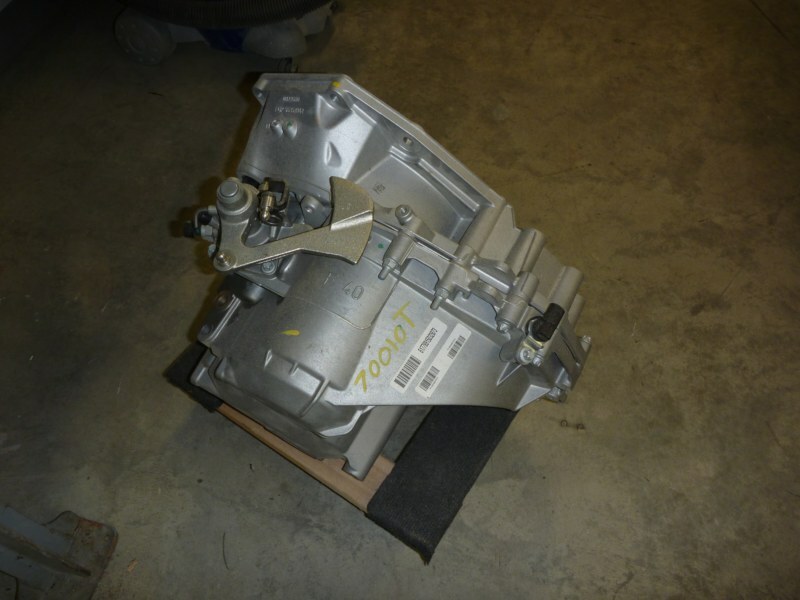 Transmission: 2006 Pontiac G6 6 speed manual (F40) This transmission is brand new and will bolt up to the L67. Clutch, flywheel, etc will have to be engineered as we build. Brakes: S10 2wd drop spindles and disk brakes up front, some sort of disk brakes out back still to be determined. Cooling: Front mounted radiator, as small as possible with openings under the bumper like my V8VAIR. Frame upgrades: I am thinking a semi tubular frame incorporating a somewhat hidden semi roll cage with a roll bar. Mostly to stiffen the car (convertible) and allow me to race/autocross in Corvair/vintage events. Those of you who have seen my V8VAIR build page should know this is within my reach. 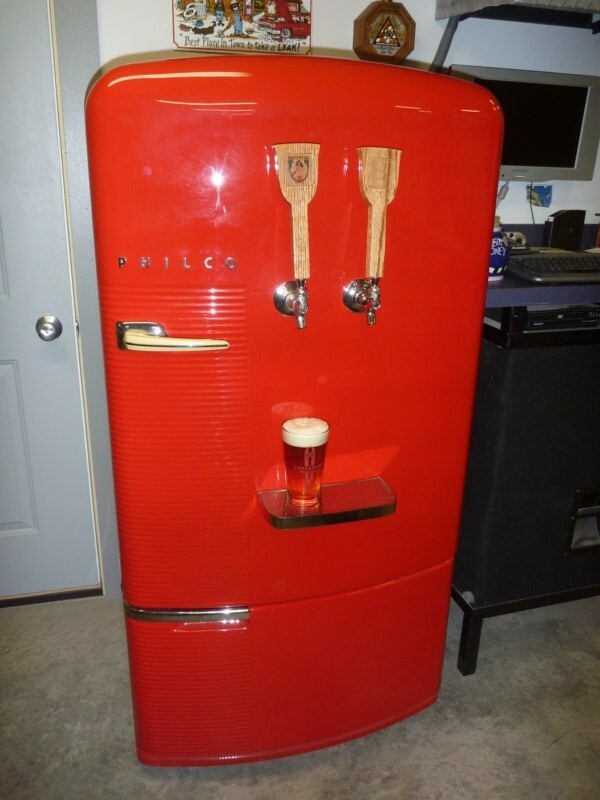 We are undergoing a major kitchen remodel in the house, but once that is finished its game on! Edited 2 time(s). Last edit at 03/04/2012 06:31AM by VairKing. Re: New Build: Project "Monza GTP"
The engine. I am not sure how I am going to mate the axles, whether I use the corvair wheel bearing or go to the pontiac time will tell. The engine might have to be clocked towards the rear of the car to clear the back seat. I will make this fit! This engine makes 240 HP as it sits right now, once the aftermarket exhaust is fabricated and an aftermarket intake fabricated, and the PCM re-flashed to match the 6 speed manual, it will probably make over 300 hp. The leading Grand Prix performance parts place, ZZPerformance, is located right in my home town. They have a dyno and are excited to do some computer tuning! Edited 1 time(s). Last edit at 09/06/2011 03:20PM by VairKing. 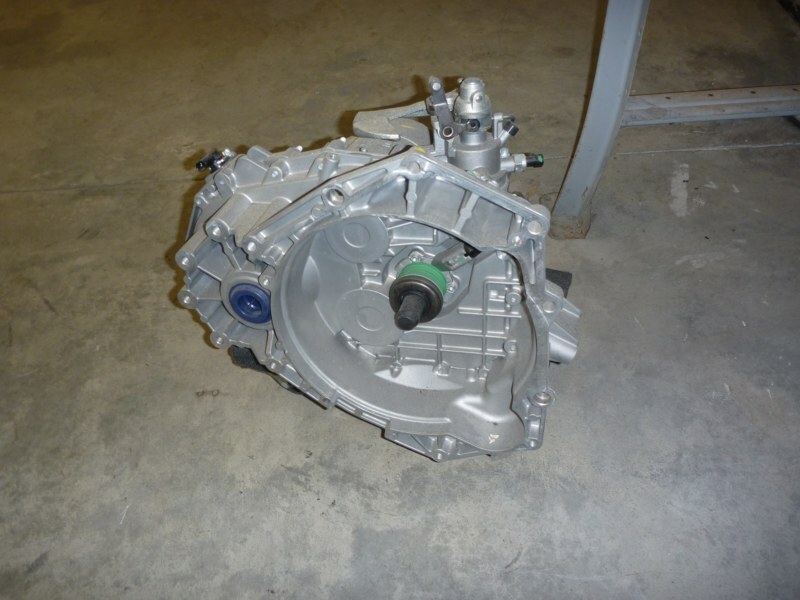 The transmission: This is a 2006 F40 6 speed manual out of a Pontiac G6. One person in the whole internet has swapped this into a Grand Prix and has confirmed the bolt patterns are the same. 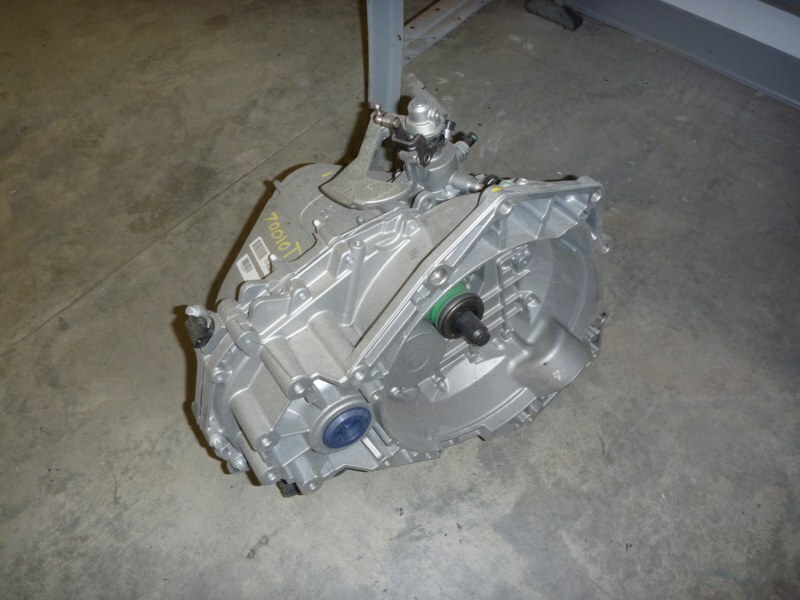 A flywheel from a 3.8 Camaro will bolt up to the motor, however the clutch and pressure plate have to be custom made or sourced. The G6 V6 is rated at 240 HP, so I will be pushing a bit too much power into this transmssion, (300 hp) but my car should weigh at least 1000 lbs lighter than the GP so maybe it will survive? WOW, NINE PULLEYS ON THAT ENGINE? YIKES! The trans looks great! Who's the other guy that did this recently? 9 Pullies, but changing the belt(s) is sooooooo easy! 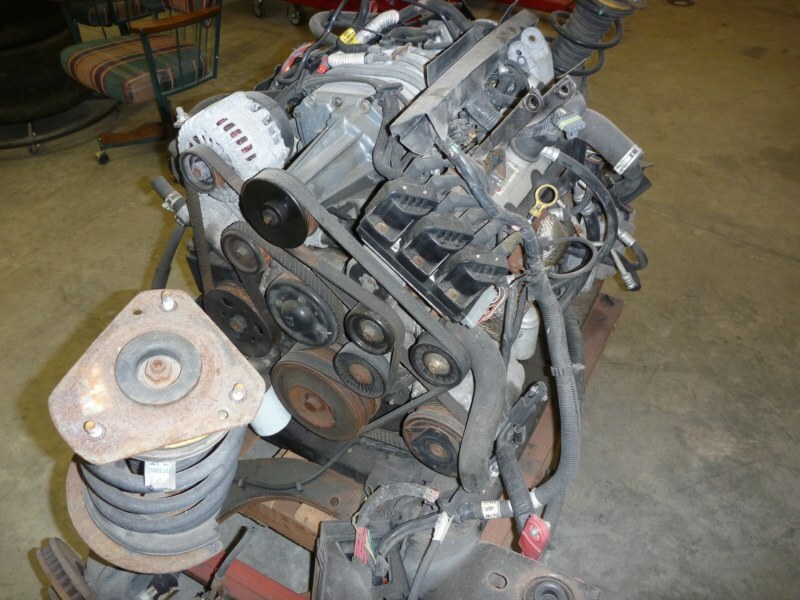 Have you looked at Frank Parkers install of a Caddy engine/trans? He modified his Corvair to use the Caddy suspension. He recommended using a different year because of different widths which varied by the year of Caddy. 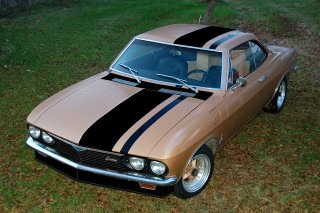 Did your doner car have a similar track width to your Corvair? Looking forward to the build and the results. Should be a killer! Looking forward to the build also, I want to see the front end replacemnt (in detail of course) beccause I have a clip similar to yours that needs swapped. 68 500 cp 95 3spd blue "DAIRY QUEEN CAR"
Wow finally some one else that thinks like me that is the motor of choice for me also if I ever was going to modify a corvair , there is a car with I think 4.6 ? caddy v8 auto overdrive complete with entire strut suspension and cv axels gets 34 mpg I saw the car at the first corvair Olympics the only problem was he had to run the stock front drive wheels to keep them under the fenders he did not flair the quarter panels like the north star corvair . Looks like a great project. I have thought about such a swap, but you are way ahead of me and most likely be finished before I even start gathering parts. Do check into Frank Parker's Northstar conversion as it has a lot of similarity to what you are doing. The track width and height of the McPherson strut cause problems with useing the stock Pontiac suspension. Frank actually widened the rear fenders a couple of inches. John Lanning of Ohio also has a transverse V8 conversion. It was built by a Detroit club member and uses a 3.5 Caddie engine and transaxle. 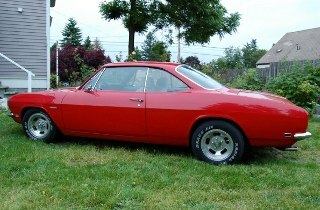 John's car was the inspiration for Frank's Corvair. To fix the deer damage, I would stay away from clipping a convertible by cutting thru the rockers, even with substantial reinforcement. The deer damaged Corvair that I fixed (similar damage to yours) ended up replacing most of the fender, the hood and straightening the front panel. This way you retain all the original rocker strength and can add what additional bracing you think is appropriate for the engine conversion's additional HP. That's going to be one fast car when you're done. I'm interested to see the progress. Corvairs have to be tuff cars to take a lick like that and not close up the door to fender gap no more than it did. I reminder seeing someone put at F40 in a V6 Grand Am. I would think the V6 Grand Am may be similar to the smaller V6 Grand Prix? 65' Monza 6.0/TH425/C4 front suspension/solid 8.8 rear. Mid engine project. Was a vair at my local welding shop and the guy was doing the same thing,,he welded mounts for the entire engine cradel X frame and mounted the entire drivetrain behind the rear seat,,he used the suspension axels and entire disc hub from the donor car and just locked the steering straight,,never got to see it finished but it looked like it would work great! I think you'll be pushing it on the durability of the transmission, especially given the torque of a supercharged motor. That would concern me more than the HP. If you're after 100% turnkey reliability, why not just stick with the auto transaxle that goes with motor? Also, have you considered the 5.3 V8 and transaxle from a newer Grand Prix or Impala. Since the motor is aluminum, it probably ways within lbs of that supercharged 3800. Regardless, I'm interested to see how it works out. Transverse mounting a V6 would save 6 or so inches in width and would make it easier to balance the weight. I don't think so. If the motor is transverse and the two motors are roughly teh same weight (which they are), it wouldn't matter if it's a cast iron V6 or an aluminum V8. You would have the same amount of weight in the same location. There's also no appreciable difference in the width of a V6 vs. a V8. A V8 is obviously longer, but if mounted transversely, that extra length would be side-to-side, so no impact on back seat room. Only if the motor is mounted longitudinally would a V6 give you more options on balancing the weight. I am not really in love with the idea of using the GP struts or cradle. As of right now I am thinking I would be better off just making new engine mounts and supports, and either adapting the CV joints to the U joint and using the Corvair wheel bearings and stock rear torque arms, or custom make new rear torque arms with a modern wheel bearing assy. The Grand Prix wheelbase is about 6" wider than the Corvair.